Artificial reefs are usually created by sinking a ship (after it has been thoroughly cleaned to prevent any toxic substances from entering the marine environment) or some other massive metal or concrete structure. Marine sediments gradually collect in, on, and around the objects, which are rapidly colonized by marine life. For rapid reef building, individual corals are sometimes transplanted onto the new structures. The latest artificial reefs in Mexico are works of art. 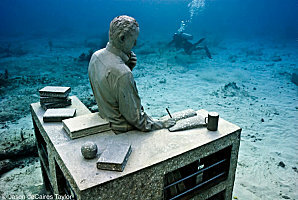 Jason deCaires Taylor, a British artist and dive instructor, has built an extraordinary collection of concrete sculptures and then carefully positioned them underwater in a marine park near Cancún, Mexico’s most popular tourist resort. The objective was to create an underwater “museum”, which divers and snorkelers can explore, while simultaneously providing a variety of structures for sea-life to inhabit. One of the more remarkable sculptures is entitled “The Archive of Lost Dreams”. It features a librarian (pet dog at his feet) caring for and cataloging a collection of messages in bottles into “hopes”, “fears”, etc.. Another of the sculptures is a full-size model of the iconic Volkswagen Beetle. The art-park, begun in 2009, is planned to house 400 sculptures in all and is billed as the largest underwater art museum in the world. Another work now under construction is modeled on the ears of every child in a grade school class; it will be fitted with a hydrophone to enable marine biologists to analyze reef sounds (New Scientist, 17 December 2011). Marine grade concrete is used for the exhibits, which are built to withstand a Category 4 hurricane. It is anticipated that hard and soft corals will eventually cover the sculptures, partially making up for the damage done to natural reefs by storms, tourists and boats, and reducing visitor pressure on the natural reefs. The natural reef off the coast of Quintana Roo, is part of the Mesoamerican Reef, the longest coral reef in the northern hemisphere and the second largest coral reef in the world. It is under constant pressure from coastal developments such as new hotels and cruise ship berths, as well as from climate change. The marine park near Cancún is visited by about 800,000 tourists a year. The artist may think his idea is laudable, but not everyone is convinced. Critics argue that art works are not a good fit with the natural world, and why try to improve on nature? In addition, if artificial reefs are not carefully sited and well managed, they may be torn loose during storms and then cause extensive damage to any nearby natural reefs.